This month it has been hard . Between the Chemist Warehouse 50% sale and online sales I have wanted to open up my purse and empty all the money out. But alas I am prevailed for another month. There was one spendage that was kind of a necessary. I bought a new laptop! My 5 year old one kept crashing the other day so with exams coming up I really needed a reliable laptop. It runs windows 8 and it feels like I'm learning to use a computer again. 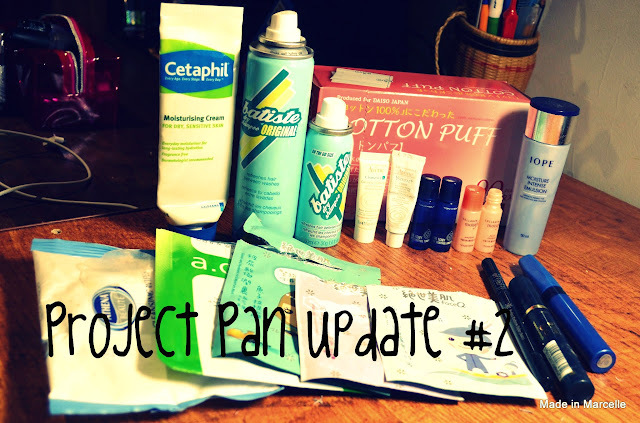 So you might remember in my last Project Pan post that I was 2/5 through my '7th' product. So here's where I'm going to start. P.S. I decided to count 10 sheet masks as '1 product' because I usually get them in packs of 10. I warn you now, my counting gets a little confusing from here onwards. Another product in my deluxe sample kit that I've finished. Love this emulsion/light moisturiser. Works great in warmer weather and it doesn't make me all shiny during the day. I find that it really needs the cream at night to really be super moisturising. Another dry shampoo. Definitely prefer the Original scent to the Blush. Seriously I go through way too many of these. But they make my flat hair so much more poofy. My favourite cotton puffs. Doesn't leave any fibrous residues and is so versatile, for removing makeup or nail polish. I got this sample a while ago from work when I was looking for a moisturiser for my crazy acne breakouts at the time. The first time I applied this my face my skin felt quite tingly. It was nice but I really cannot say how it fared for breakouts because I did not use it long enough. Repurchase? Maybe if I have another bad breakout. Another sample from work that I tried to compare with the Cetaphil moisturiser for winter. This is not it. It comes out in a weird yellow cream that did not smell great. I did not really like this one. Plus it is more of an anti-ageing product anyway. And here starts the list of the numerous samples that I got in Korea. I still have a whole box full despite giving heaps away already. I love you Korea and your free samples. Not a bad toner. I would actually consider trying this in place of my Witch Hazel when my skin breaks out. I like emulsions which are targeting acne prone skin. They tend to work quite well for me. This felt quite nice and my skin did feel quite refreshed afterwards. As you can see I had a bit of trouble getting the rest of the product out of the bottle. I hate these little containers sometimes. I can see why this set is popular. My skin felt instantly hydrated but I did not really feel this carrying out throughout the night. Although I would consider using this as a day moisturiser. I love sheet masks. They are great for an instant skin repair. And my face looks so glowy afterwards. So I am always wanting to try different ones. I started using these FaceQ ones which I got in a sampler pack with 1 of everything. As far as I know, this brand is a sister brand to the well known My Beauty Diary one. Correct me if I'm wrong? A very interesting one because this actually had slits on the side of the sheet where you can hook it around your ears. There's also a chin component which wraps underneath and again hooks on. Quite enjoyed the chin part because that area and the neck are sometimes neglected. My only issue is that there was no separating plastic sheet so it was a little fiddly when trying to open up the mask. Repurchase? Yes only because I usually don't lie down when wearing face masks and they tend to slide off. With the ear slits, this held on really well. It was moisturising and my face did feel very soft afterwards. But this is the effect I get with most sheet masks. Repurchase? Probably not. Only because I enjoy trying new masks. This was an extremely refreshing mask and very soothing (as the name suggests). I liked this for calming down my irritated skin. I bought this in Korea a while back and only used this now. This was not good. The sheet was quite thick but this did not mean that it was soaked with essence. It dried out extremely quickly and did nothing for my acne skin, despite having soothing green tea and aloe. The other thing is that there was no plastic sheet. Korean brands really need to get onto these. They stop me tearing the whole thing into bits with my man hands. I remember buying these in a multiple pack because they were cheap. And that's where I went wrong. The sheets were extremely thin and dried out so quickly (despite me storing them upside down). These felt like they were scratching my face and I still had so much makeup left over. I ended up using these to spot clean my brushes towards the end because I just could not use it otherwise. I love Korean eyebrow products because they look so natural and suit me better than "Western" brands. This was a great product. It has a triangular 'lead' which came off quite light but was buildable. The staying power wasn't too bad. The other end of the pencil came with a detachable double ended spoolie-sponge which you could alternate between. The sponge worked surprisingly well to even out the product if you applied it unevenly. Then here comes the problem, about half way through the lead the insides started falling out. I had to keep putting it back in and make sure that I was not holding it at an angle where it could slide out. It was a hassle. Then it finally happened where it fell out and broke. So I ended up losing about half my product. Was not so bummed out because I remember this was crazy cheap. Repurchase? No, only because of packaging fail. My very first mascara that I had ever tried. Loved it so much and repurchased it whenever it was on sale. But now I have realised that there are better ones out there. This gave a bit of 'natural' volume which was very flattering. It felt kind of sad throwing this away because this is where I started off. I think I got this as a freebie ages ago and decided to finally use it. (I am a mascara hoarder, there's a box full of unopened ones in my draw) This gave extremely natural looking lashes, not good for my super sparse eyelashes. Shopping temptations should be less this month because it is exam time. Sigh. But I'm really going to have to make a real effort to use more things up.